I love Thanksgiving. Partially because I love this time of year when the leaves change colour and it starts to get cold outside, and partially because I enjoy spending time with family. But honestly, the main reason why I love Thanksgiving is because it’s one of three times a year where I get to gorge myself on turkey, stuffing, mashed potatoes and gravy. Recently, I’ve taken it upon myself to improve my cooking skills. I’ve made a number of desserts and baked goods, and a few dinners here and there. 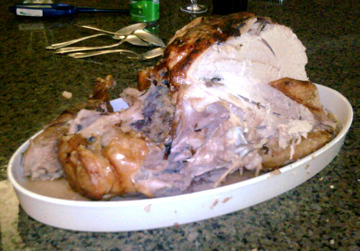 Yesterday, I decided to put my cooking to the test and make Thanksgiving dinner. 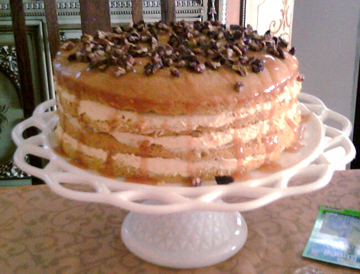 For dessert, I made a luscious four layer pumpkin cake, which was no piece of cake to make. My relatives brought over the veggies, yams and potatoes: I took care of the cooking. I made candied yams, stuffing, gravy and of course, the turkey. As a rule, I try to stay away from raw meat, mostly because the texture of which grosses me out, especially when it still takes the form of a bird. But after popping a Gravol, and with my mom’s guidance, I managed to overcome my squeamishness. And after a while, manhandling the turkey stopped bothering me. The worst parts: removing the neck, stitching the bird closed (I kept stabbing myself) and lifting the turkey in and out of the oven (it was just over 17 pounds). A little advice: for anyone else out there who gets a little woozy dealing with meaty foods, pretending you are a doctor can help take the edge off of the situation. You could also pretend to be a coroner, but that’s a little morbid for me. The dinner went off without a hitch (read nothing was burnt) and my dessert was a hit. And the best part about Thanksgiving dinner is that there are always tons of leftovers for today, tomorrow and the rest of the week. 10 down, 91 to go.